Latest news about the 2017 Accent Value Edition (price, safety features, engine specs, etc…). Hyundai is no longer the company they once were. Long gone are the days when buying a Hyundai meant you had to compromise quality. Today, South Korean largest carmaker produces some of the best vehicles in their respective segments. They maintained their affordability, but raised the quality level so high they’ve surpassed most of their competition. Nowhere is this more obvious than in a new Hyundai Accent. It’s a perfect blend of affordability, practicality, comfort and style. 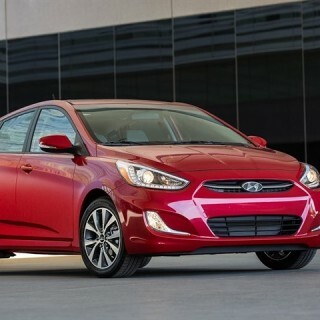 Recently, Hyundai Motor America decided to launch a new Value Edition to the already rather inexpensive Accent, making it one of the best value for money car around. The 2017 Hyundai Accent Value Edition, like its name suggests, is a midrange model offering near base price with lots more equipment. It costs just $705 more than the standard, base 2017 Hyundai Accent SE but you do get a lot in return. First, the 14-inch steel wheels of the SE get replaced with great-looking 16-inch alloy wheels. At the back, the Accent Value Edition loses the drum brakes and gains modern disc ones. Inside, you get cruise control, a steering-wheel with audio controls and a storage bin. Proving that Hyundai knows how to appeal to younger generations is a Bluetooth phone and audio streaming. With power windows all around, remote keyless entry and A/C, there’s no shortage of amenities. The hood hides a small 1.6 liter four-cylinder unit codenamed Gamma. It develops 137 horsepower at a rather high 6300 rpm and 123 pound-feet of torque at 4850 rpm. Despite the relatively low figures, the Accent is anything but on the road. Don’t believe the figures however, as this car is much more impressive in real life than it is on paper. The engine is made entirely from aluminum, so the car is very light. The engine is responsive and the chassis agile. The Accent really feels nimble and zippy, especially in city driving. You can opt for a six-speed auto or a manual. Both are great, but the auto is that little bit better for tedious stop and go traffic situations. A manual equipped Accent returns 31 mpg on the combined, and the auto is not that far off. 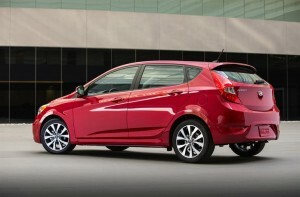 Although its dimensions may suggest it’s a subcompact, the Accent actually falls under the compact sedan class. The reason is obvious once you know that it offers 103 cubic-feet of cabin space in sedan form and an even greater 111 cubic-feet in hatchback guise. The rear seats have a 60/40 split and can be folded to increase cargo space. There’s plenty of room in both rows of seats, with comfort being at an all-time high. It’s the perfect mile muncher, or everyday driver. Starting at just $16,450, the 2017 Hyundai Accent Value Edition price redefines what value means. It offers equipment worth more than a grand for just $700. If you don’t believe us, go and test drive one for yourself. You’ll be more than pleasantly surprised by just how good the Accent feels.